The Jefferson nickel coin has been the five-cent coin struck by the United States Mint since 1938, when it replaced the Buffalo nickel coin. Since 2006, the copper-nickel coin’s obverse has featured a forward-facing portrayal of Thomas Jefferson. 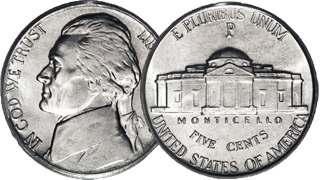 As nickel was a strategic war material during World War II, nickels coined from 1942 to 1945 were struck in a copper-silver-manganese alloy which would not require adjustment to vending machines. The Jefferson Nickel coins bear a large mint mark above the depiction of Monticello on the reverse.